Yes, I know that I'm supposed to be working on the roof for the Nebraska Sod House, but I encountered a major and irresistible distraction that I just could not ignore. The soddy needs a wood-burning cookstove, although it won't be burning wood. What it will be burning is information that I'm withholding until it's time to start cooking that first meal. I looked and looked at cookstoves online, and I finally found one that I really like, even though it's obviously made of wood and not cast iron. I wanted a stove with an overhead warming oven, just because I like the extra height that it offers. I also like that it has a small three-burner cooktop, so it isn't as deep as those with four or six burners and will fit nicely in the small sod house. I ordered the stove, thinking that I'd work on changing it a little when I'm ready to furnish the soddy. The stove arrived quickly, and I opened the package and immediately dropped whatever I had been working on and started rummaging through my bins and drawers and boxes and bags to find parts that might work to turn the shiny wooden stove into a well-worn cast iron cookstove that will serve to feed and warm my young homesteaders in their prairie venture. 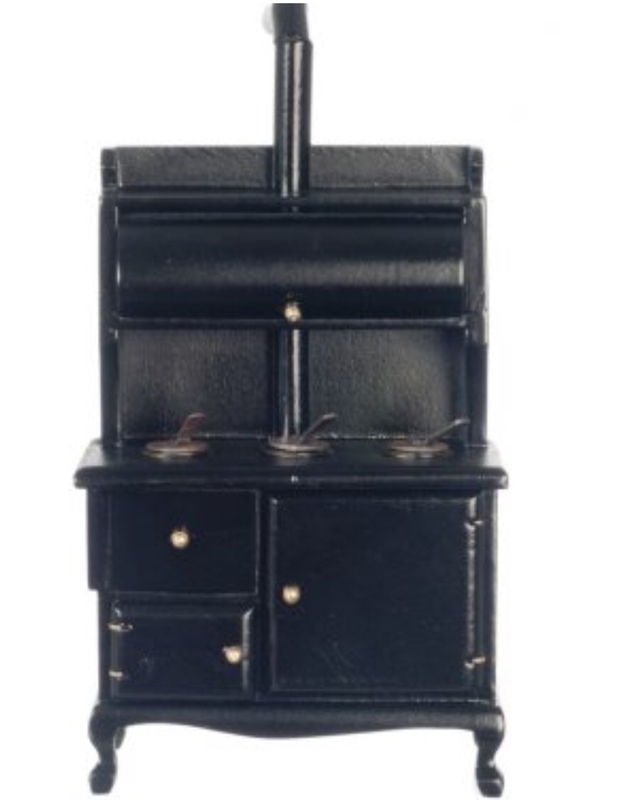 This is the original wood stove that I ordered because I like its height, although I thought that it looked more like a cabinet than a cast-iron wood-burning cookstove. I took a chance, hoping that I could make it over. I started the makeover with a few brass photo-corner embellishments. There are more embellishments to come. I removed this broken warming shelf (on the left) from an old cast iron stove with missing parts. I used a bolt cutter to snap off the protrusions from one edge so that I could glue the shelf flat against the side of the stove. The embellishments are complete - and the warming shelf has been glued on successfully. I cut a circle from wine packaging for the center of the oven door. The first coat of flat black paint has been applied over all. The stove after a second coat of paint. For a final finish, I added some age and wear by lightly brushing on a rust-color wash in spots. All the pieces are glued on. The oven door handle has a larger metal piece (a button) for a backplate. You can see the half-round stovepipe against the backsplash. A close-up view of the half-round stovepipe. I found a small metal piece in my stash to use for the spin vent draft control. (I think that's what it's called.) It isn't quite the right piece but was as close as I could come. I painted it black, hoping that it would sort of disappear into the stovepipe. I bent a flat piece of metal and twisted wire around the end to make a lid lifter, then replaced the original small lids with larger ones from the broken stove. I never thought that broken old stove would be so useful! Additional views of the completed cast-iron cook stove. So that's what I've been doing with my soddy time for many hours. I'm happy with the stove, and I think the homesteaders will be pleased. But now I hear that soddy crying out for a roof - quick before the next rainfall! I'd better get busy. Oh very well done! Your modifications turned it into a stunning piece. Thank you, Megan. 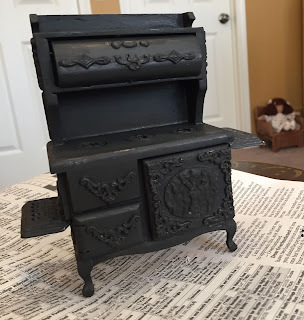 I entered blindly into this project, so you can imagine my relief (and pleasure) when the stove actually turned out just about the way I had envisioned it. Whew! That is fantastic work. the embellishments add so much character and interest and the finish is beautiful. The rust is a great touch and it looks superb. amazing work! Hello, Giac - Thank you! I thoroughly enjoyed this project, and looking for (and finding!) those bits and pieces to use for embellishment was so much fun. 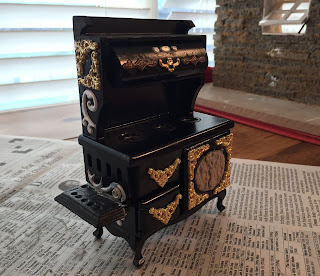 There won't be many pieces of furniture in the soddy, and the cookstove is the most important, so I wanted it to be somewhat special without being presumptuous. (Too big for its britches, my mother would have said!) I'm happy that it turned out pretty much the way I hoped it would. I'm looking forward to seeing it in its place in the soddy. Hi, Troy - Thank you for such a nice compliment. I started the stove makeover with a fairly clear vision of what I wanted, but without a clear plan of how to get there, so I'm happy and relieved that it actually worked out. The stove brings back memories of my Muskogee childhood; one of my grandmothers cooked on a wood stove very similar to this one, even when she could have had a gas range. Her kitchen was always cozy, which is my hope for the soddy as well. One of the most wonderful things about minis is that there is no "supposed to"! You can work wherever the inspiration takes you, and this stove is truly inspired and inspirational! There is so much joy when that creative spirit moves you, and it shows in this incredible stove! I love every detail you've added - the stove looks not only ornate but very practically functional! The paint and rust effect are wonderful, and I can't wait to find out what those industrious homesteaders used to heat it! I hope you find the same joy in the roofing, and that you'll be back to share it with us soon! 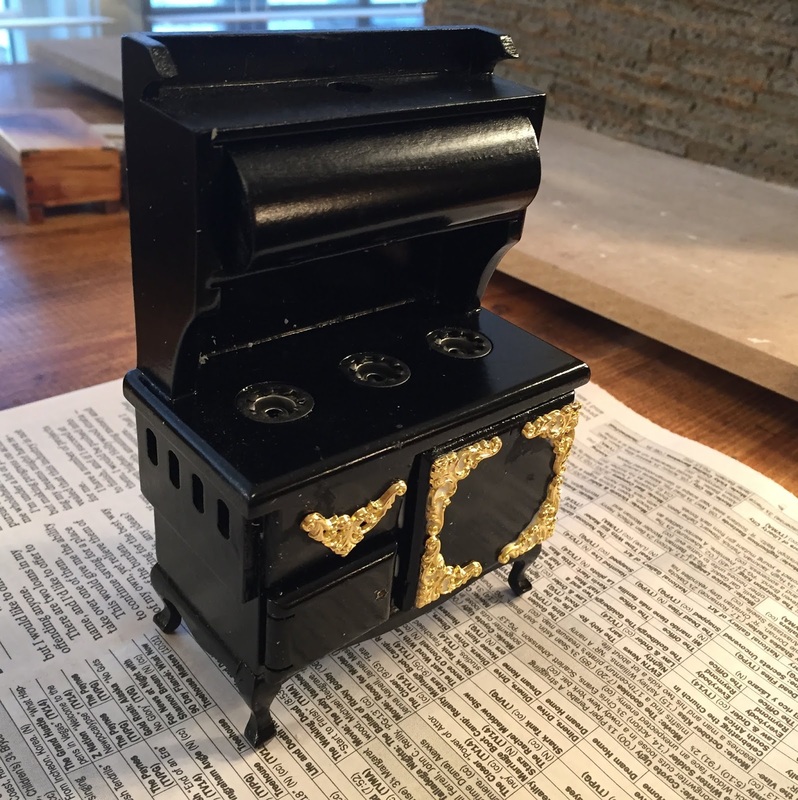 Hi, Jodi - I did find much joy in the stove makeover; I think it's that satisfying feeling of creating "something from nothing," although I did have great "bones" from the original stove to get me started. And then I just kept having more and more fun finding more and more stuff to glue on! I'm very happy that you like the finished cookstove, since you and your beautiful hall tree were part of my inspiration, and I thank you for that. Now it's back to that roof, and I'm going to have to search pretty hard to find inspiration there! But it'll still be fun and very interesting, and I'm excited about it. Hello, Rosa Maria - Thank you so much for your lovely comments! 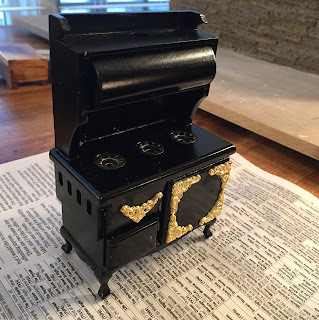 I'm very happy that you like the cookstove makeover; I found it to be quite a satisfying project, and lots of fun to do. Now I just hope the soddy's roof will cooperate as nicely! Una transformación fantástica!! ahora sí que se ve real!! Hello, Pilar - I'm glad that you think the cookstove looks real! That's what I was striving for, but I didn't know exactly how to go about it. It was easier to do than I expected, and I'm happy too with the final result - and relieved that I didn't make a mess of the whole thing! Hi, Betsy - I appreciate such encouraging comments from someone experienced in using cast iron cookstoves! My grandmother had one, and my mother used one for a time when I was small, but of course I didn't pay the attention I should have to the inner workings - or the outer decoration, for that matter. I did find many photos of gorgeous cast iron stoves online, which helped. (I think I'm in love with those stoves now and would love to have a real one, even if only for "show.") I had a great time turning wood into cast iron, and I'm thankful that the stove makeover worked better than I expected. Now back to the roof! *claps* How wonderful! You have worked magic with this stove Marjorie! When I first saw the embellishments going on, I was a bit concerned with where you were going.. but I guess I don't have the vision for that stuff because once you added paint, it came to life! Amazing! I particularly love the added shelves (they are going to be great places to display minis). and the stove pipe upgrade. I think the most ingenious use of findings is the wine packaging in the centre of the oven door! Brilliant! Hi, Sam - I had to chuckle at your comment about not knowing where I was going with the embellishments for the cookstove makeover. I didn't know where I was going either! I felt as though I wore a blindfold to walk a tightrope! The thought that kept me gluing on one thing after another was that I could always pry it all off with a sharp tool and start over again. Thankfully, it didn't come to that. I've found that those wine packaging pieces are even better than egg cartons for achieving interesting textures on various things, so I was happy to find one more use for the packaging. Thanks so much for stopping by. Hi, Lori - As always, I find your comments very encouraging and helpful. I especially like your opinion about the white ceramic door handles on the cookstove. Robert and I had some dialogue about those handles too. I initially had some "smudges" on the handles - from smoke, from sooty hands, from dusty floors, from all manner of things in a dirt house. Robert really liked the stove, but he thought the handles should be whiter. He often has problems with my "aging" so many elements in my projects and wonders why none of my people are allowed to have anything "nice." So I made those nice white handles for his sake. I'm sure, though, that as soon as the stove is in the soddy and in constant use, those handles are going to be dirty really fast! My soddy housewife is a good cleaner, but she's also realistic and knows when to quit. She prefers to go out and pick prairie flowers and let the dirt house have its own way. Thanks for the interesting input! I LOVE IT Marjorie! It is amazing how the addition of little bits of embossed trims and the right finish, can transform painted wood into heavy metal! I can actually feel your stove gaining weight in each of the photos! Hi, Elizabeth - I do enjoy adding those bits and pieces and layers of paint to my projects! I hadn't thought about my wood-to-cast iron stove gaining weight - but I think you have a point. Although it's a relatively small cookstove, it's going to take some dismantling and two strong men to get it into that soddy! That's heavy metal! Thanks for stopping by. Wow I love your stove. It is a masterpiece. Perfect piece for your Soddy. Hi, Maria - I'm so glad that you like my "old" stove! I had a lot of fun putting it all together, although I was never exactly sure of what I was doing! But I'm happy with it, and I think it'll look at home in the soddy.